Hi friends! 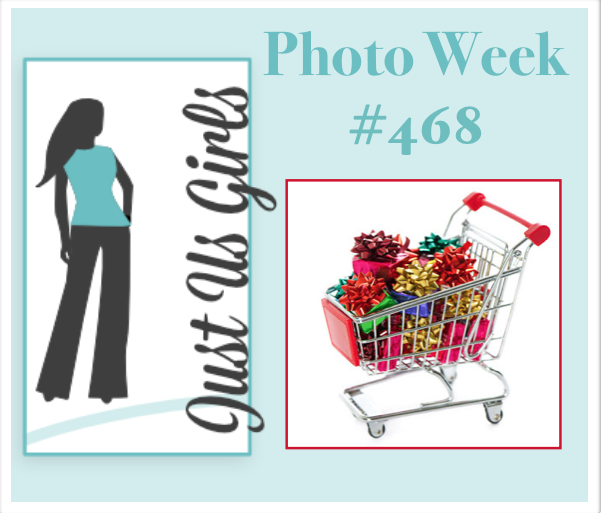 I'm the hostess over at Just Us Girls for the Photo Week challenge. 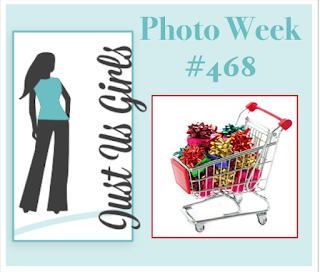 I chose this shopping cart full of bright bows and presents! I knew immediately that I would use this layering bow stamp set from The Ton. I looked at the set on their site to get some inspiration and ended up case-ing one of their cards but changed the colors. 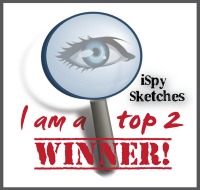 I used Catherine Pooler inks in lighter shades for the bottom layer and brighter colors for the top layer. I stamped the sentiment in black, added some shimmer spritz, and crystals. The main panel is on fun foam for dimension. 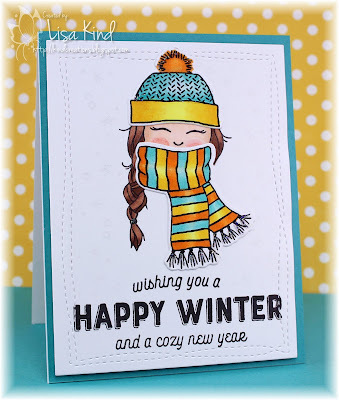 You can see more from the JUGs design team and our November guest, Claire, on the JUGs blog. 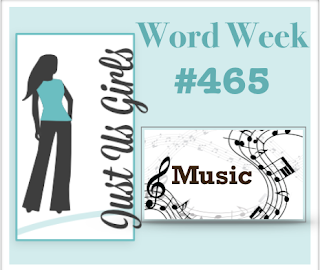 This is Claire's last week with us, and I'd like to say thanks for being such a great guest! Hi all! Happy Thanksgiving to all my American friends today! I hope you are celebrating with family and friends and are eating some delicious food (and maybe watching some football too!). Back to our challenge. 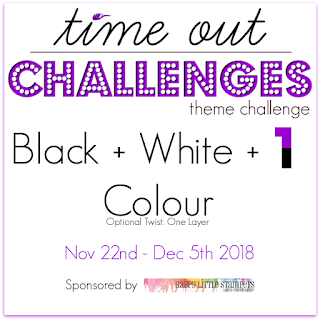 The new Time Out challenge is our theme challenge. 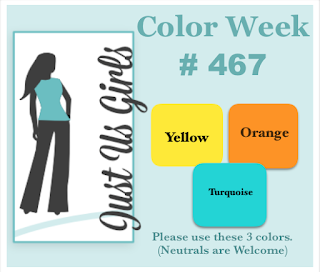 We want you to make a black and white card using one other color. To twist it even further, make it a one-layer card (totally optional). I used this Penny Black wreath stamp and stamped it in black onto a card base to make it a one-layer card (sort of...I forgot the sentiment is dimensional!). Then I simply used a red copic marker to color in all the berries. Then I added the die cut sentiment which is on fun foam. 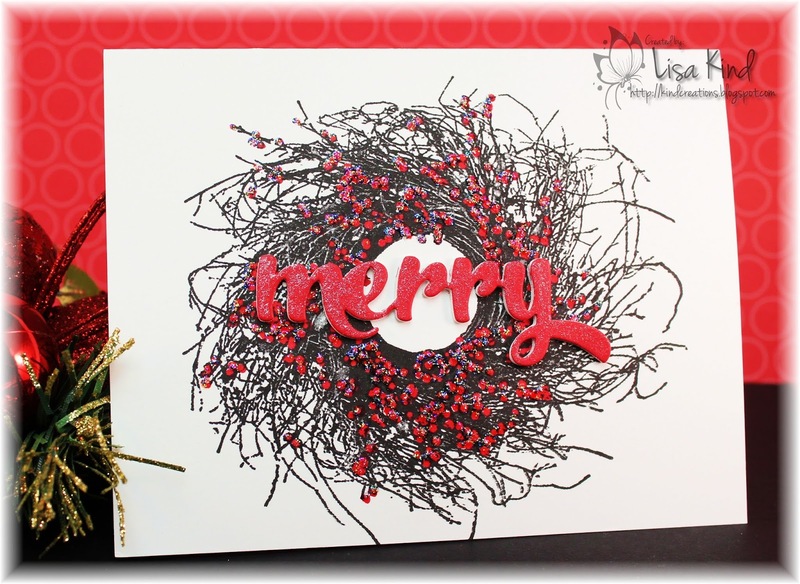 Finally, I added Star Dust Stickles to the berries and shimmer to the die cut. This would be an easy card to mass-produce for the holidays. 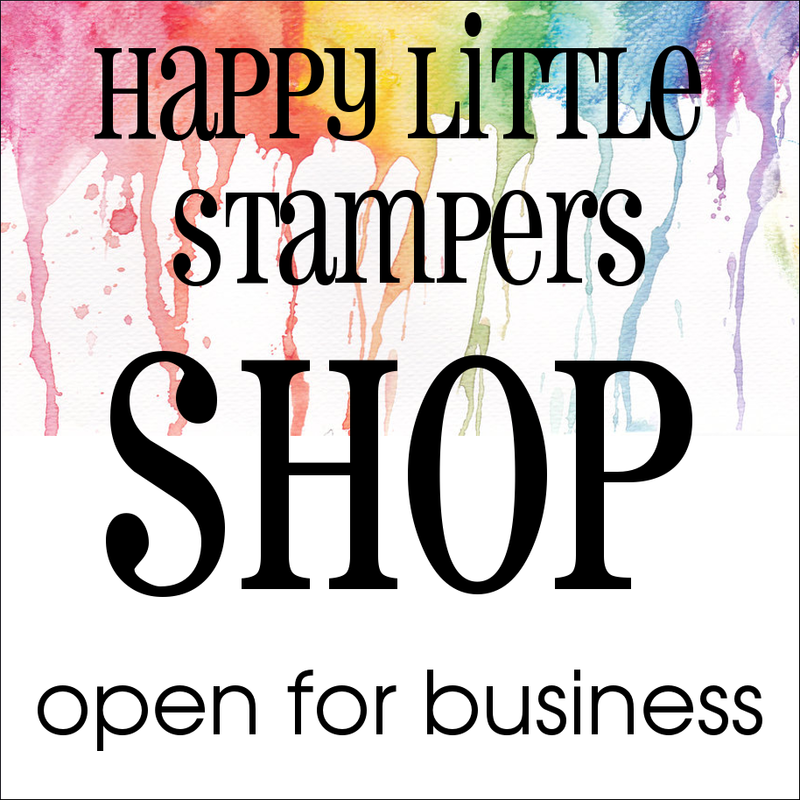 Our challenge this time around is sponsored by Happy Little Stampers. 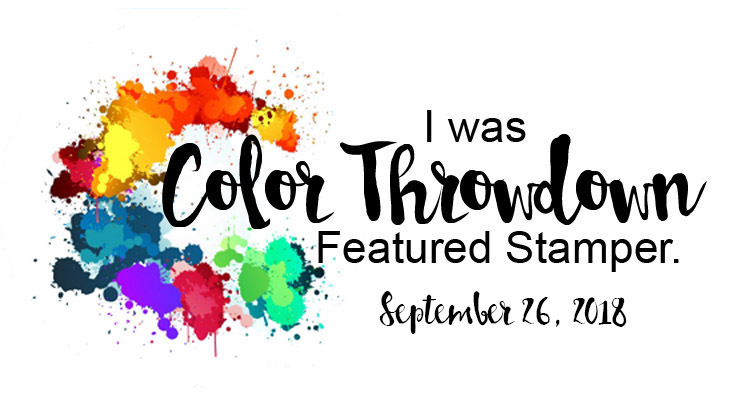 You can see more from the Time Out design team and our guest for this challenge, Joanna, on the Time Out blog. Hi everyone! Vicki chose these fabulous colors for our Just Us Girls Color Week challenge. I really had fun with them! I just got these stamps from Concord and 9th the other day and couldn't wait to use them. I thought these colors would work beautifully with these images. 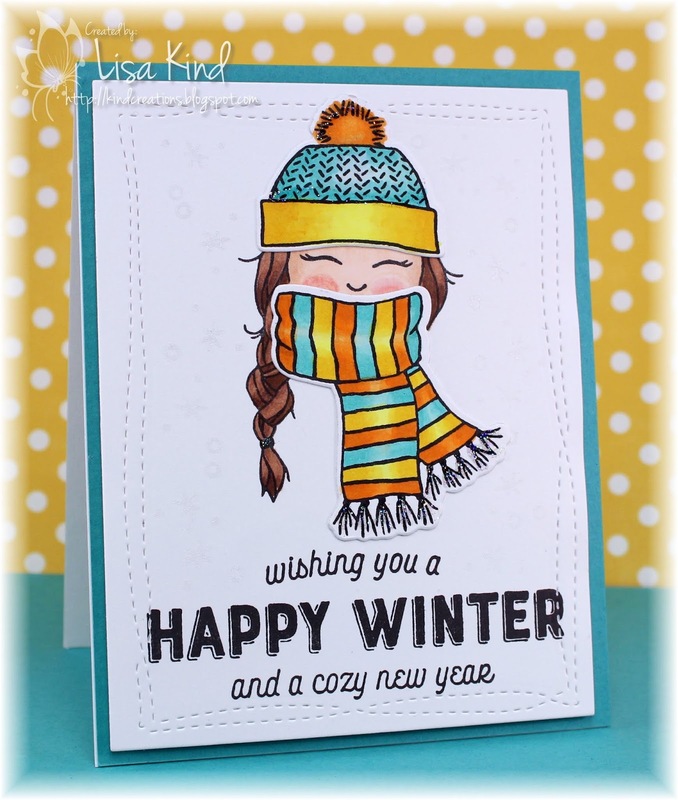 I stamped and die cut the hat and scarf then colored them in the challenge colors. The face was stamped directly onto the panel and colored. I added the hat and scarf. You can't really see it, but I stamped and embossed some snowflakes with a frosted crystal embossing powder. It is very subtle but pretty. This girl reminds me of my niece, and she will get this at Christmas. You can see more from our JUGs design team and our November guest on the JUGs blog. 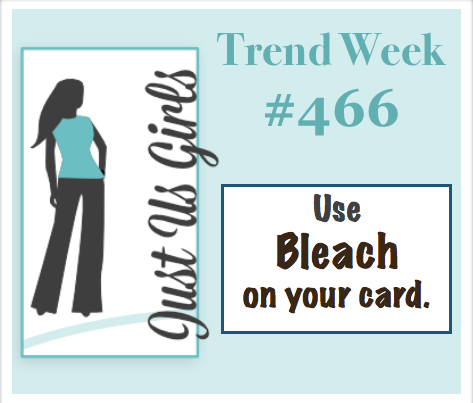 So when was the last time you used bleach? In the wash or for crafting? I must admit I've used it more in laundry than in crafting, but there's always a first time, right? 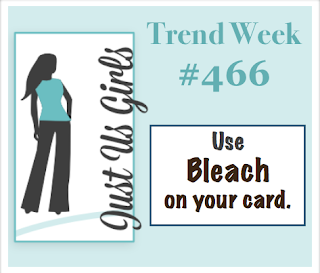 Just Us Girls wants you to use bleach on your cards. There are a variety of ways to do this as well! 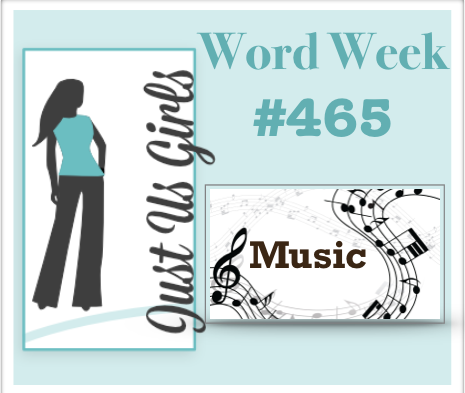 I watched this video by Gina K to get my inspiration. You can't really tell I used bleach on these flowers because I die cut them. In Gina's video, she stamped a few flowers on brown cardstock but didn't die cut them so you can see the difference in the color of the cardstock after the bleach was applied. I think you can kind of see the difference on mine if you look at the very edges. They are darker because I didn't apply the bleach beyond the embossed area. 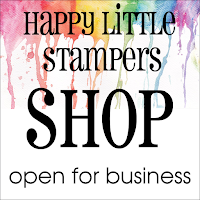 I'm loving these block print stamps from Altenew. They frame the card so nicely. I stamped and die cut some leaves in some fall colors and added the sentiment and sequins to finish it off. I think I should have used bolder colors for them because the brown flowers really stand out! Oh well! 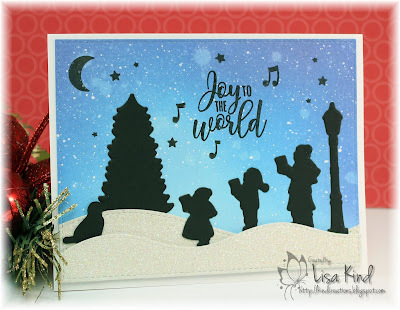 You can see more from the JUGs design team and our November guest on the JUGs blog. Hello all! 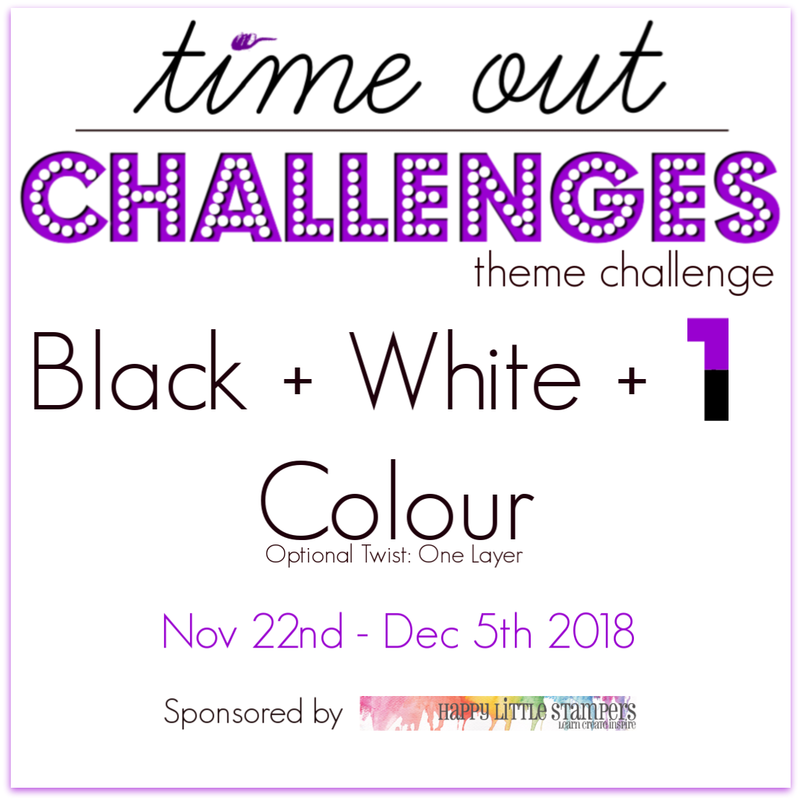 It's time for a new challenge over at Time Out. 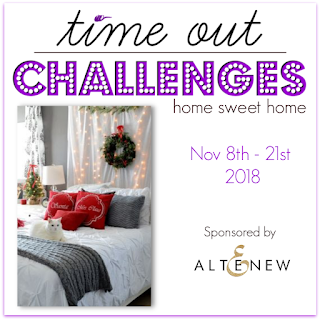 This time it's our Home Sweet Home challenge. 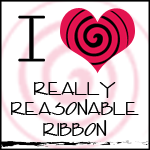 And please notice our new blog look! It was time for a change and we think it's very cool! Here's a close up of the photo to use as inspiration for the challenge. We are sponsored by Altenew for this challenge. 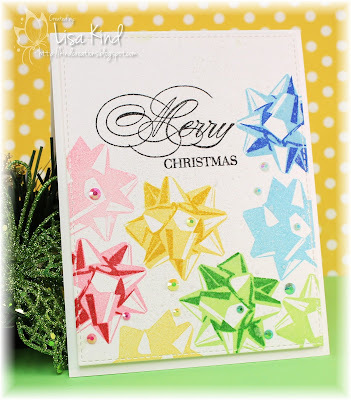 I've used two of their stamp sets on my card...Holiday Bow and Block Print. I've also used some of their inks. 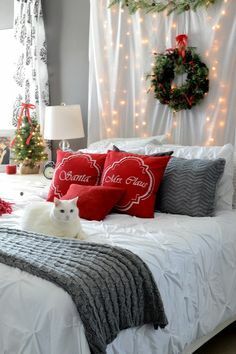 For inspiration, I chose the colors of red, gray, and white (my bow looks much more red in person) and the greenery in the wreath and tree. The background stamp reminded me of the gray pillow on the bed. That sentiment stamp (from Concord & 9th) fit perfectly below the background stamp. I added some Wink of Stella shimmer to the bow and berries. 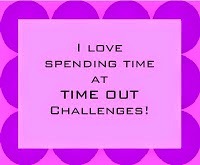 You can see more from the Time Out design team and our guest for this challenge, Mughda, on the Time Out blog.